It’s a fine art, knowing (sensing?) 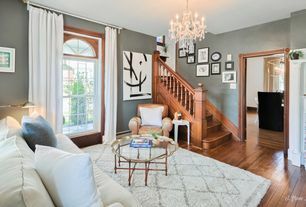 where to go modern, how to balance the vintage, to create that perfectly chic and comfortable home. 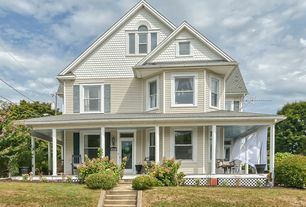 Here’s a stunning home in Myersville, Maryland (currently on the market ) that does it all with glamorous style. And here’s a few insights into just how you can create some of this effortless style in your home. There’s a few elements here which give it that fabulous look. 1. 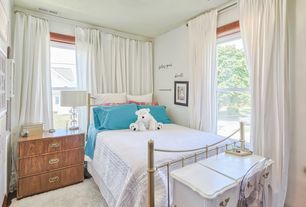 Hang your curtains at ceiling height. 2. Incorporate graphics carefully, maintaining color as the unifying factor. 3. 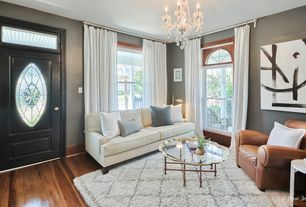 Add texture (leather, shag rug, crystal chandelier, brass and glass table). If you’ve been reading this blog lately, you know how I’ve agonized over the unpainted wood trim in our home. This house is of the same era, with similar elements. 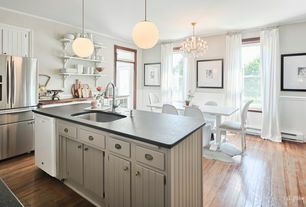 I’m so impressed how the clean, updated colors, and simple palette throughout the house allow the unpainted wood to shine as a design element and texture on its own. The opposite side of the room. I love how fearlessly the classic mirror is paired with the mid-century bookcase. Also, note the artwork over the chair. 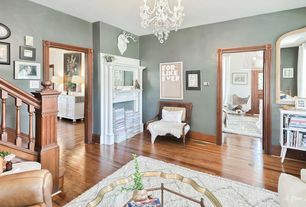 It’s an example of the graphic theme (from the modern art on the opposing wall and the shag carpet), unified still with color, but in reverse. In this oh-so-comfortable family room, the lighting sings. The bold fixtures set a tone, and the rest of the room can be quietly comfortable as these pieces alone give it the edge of style it needs. Notice here the graphic nature of the photography wall art. Also, one of my favorite elements: the acrylic coffee table. The opposite view shows how easily a TV can be integrated without dominating a room. 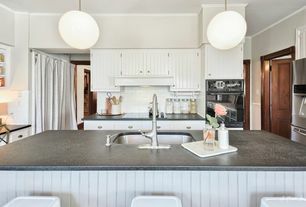 This kitchen is even brighter and more welcoming that it appears in this photograph. 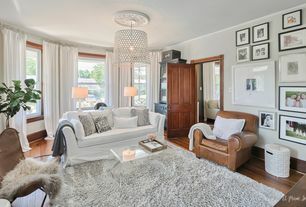 Again the lighting sets a mood – this time with modern globes and a crystal chandelier in the same room. It works perfectly, doesn’t it? The clean photographs and the sleek (and easy-to-care-for) table and chairs strike the perfect balance. The wood floors (a favorite of mine in kitchens – too seldom used) and light curtains provide visual warmth. And don’t forget the bathroom! The wood floor is again a stunning element in this room. But my favorite is that striking wallpaper! 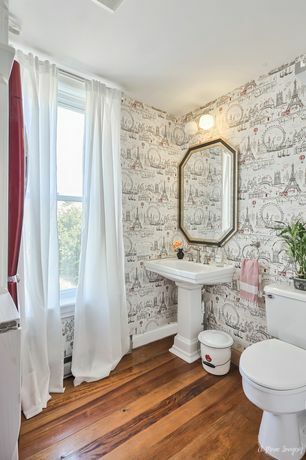 As you may know, I am not generally a fan of wallpaper, but this is exactly the situation in which to use it, and look how the paper creates an intriguing space out of a bathroom! It should also be noted that this is a house with three growing girls. Each with her own personality. 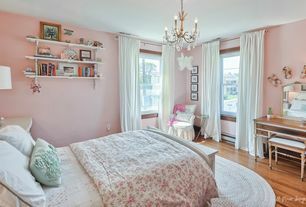 Take a look at how each room is decorated, not with items designed for ‘kids’, but with truly beautiful items, reflective of each girl’s persona and taste. Don’t be tempted by Target and Pottery Barn. Let your children experience good design and quality pieces all their lives. Daughter #2. As different as the girls are. Note that each room has all the essentials, reflected through her own personal style. Daughter #3. It doesn’t take much space to make a room beautiful, useful, and comfortable. The intimacy of this room is a huge part of its charm. Here’s the exterior of this gracious home. 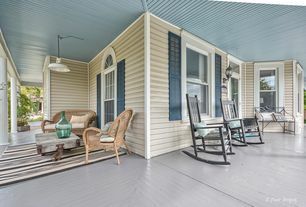 The porches, with their billowing curtains, create a whole additional set of rooms. 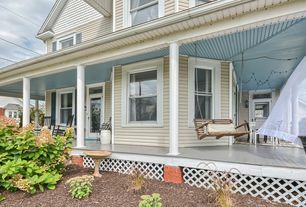 Here’s the back/side porch – the easy in and out of every day life. Love the blue ceiling. 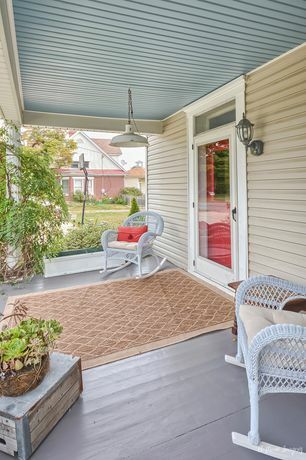 The front porch, showing off the wrap-around effect, and the generous living space it provides. 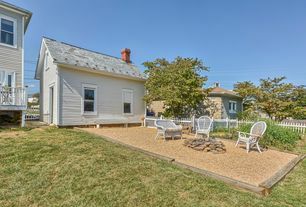 The side/back yard side of the porch. Don’t you just want to sip lemonade and watch a parade go by? And what’s become one of my favorite outdoor elements: the fire pit. 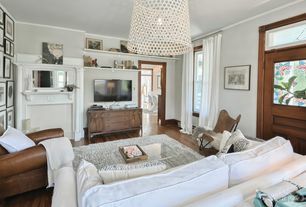 From the street you can see the classic, traditional appeal of this comfortable family home. But it’s inside that it becomes the extraordinary home it is. Try a few of these design tips and see if you don’t enjoy the modern chic it can bring to your home. 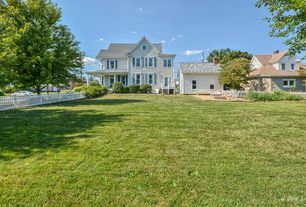 The Myersville, Maryland home is available for sale, with details on Zillow.